Going 'shady' all the way with the most interesting sunglasses for Summer. Sunglasses have long gone from being a simple piece of protection for our eyes. Now apart from its primary use it also serves as a very fashion accessory. The times when shades were worn only through the sun-full season are way in the past. Today you don't even need serious sun rays outdoors to have an opportunity to wear your favorite piece of shaded eyewear. Still Spring/Summer is the exact season when all of take this fashion accessory out. And wear it nearly 24/7. Plus the Spring/Summer season is that time when the coolest and hottest sunnies hit the stores and our wishlists. 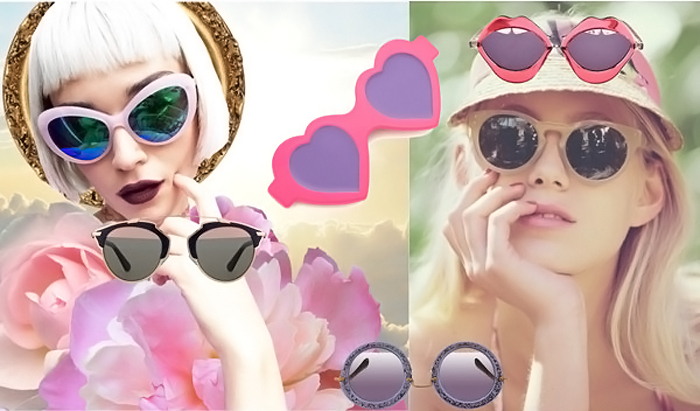 Round or circle-shapes sunglasses. One of the hottest style of the season. Thanks to hippies and boho queens we today have a chance to become children of the sun of the 21st century edition. Statement frame or elegant metals or plastics, with a bit of deco elements, like flowers or palm trees, involved, with simple black or colorful lenses - it's up to you, lady of the sun! Summer is always about revealing your inner freak. This Summer season it's about the coolest frames you can imagine. Elegant roses and a piece of a horse, childish hearts or pineapples, and totally freaky-freaky lips. As they say, there's one for every single freak out there. Statement shades are all about thickest frames and boldest colors or prints. These ones will make you go unrecognizable simply because the only thing people will look at are the sunglasses. In case you need a cherry over your casually simple outfit, then go for a statement piece of Summer eyewear! Metal-full sunglasses are pure classics. Just think of Aviators or Dior's So Real piece. Yes, pure modern day classics. Now wood sunglasses. I bet there's no single person on the planet left, who haven't heard of wooden frames yet. It's been quite some time since the wave of wooden ones started, still it remains quite a thing even today. So, eco-friendly fashionista, we got a few woodens for you here!